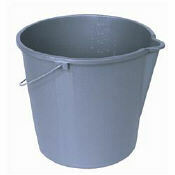 Solvent resistant sturdy pail for use of general clean up. Spout for easy pouring. Please note: This bucket ships in a variety of colors. Depends on inventory.